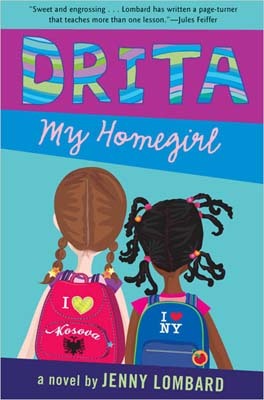 Drita My Homegirl by Jenny Lombard. G. P. Putnam’s Sons, 2006. Currently available. Face Value: I love it! It’s colorful and the styling is perfect for middle grade readers. Although we only see the back of Drita and Maxie, their personalities are clearly conveyed in the illustration. I would like to see more illustrated covers like this. Does it break the slate? Yes! Maxie and Drita are a Slatebreaking team. Together they build a friendship that bridges cultures and soothes lonely hearts. Maxie is an attention-seeker and Drita is a dreamer. The two make a compelling pair. Who would we give it to? I would give this book to girls who struggle to make friends. Drita My Homegirl shows a friendship that is unlikely and challenging, but still very fulfilling for both girls. Review: Jenny Lombard was not shy when choosing a topic for Drita My Homegirl. She created two girl characters fraught with challenges, and that leaves a lot to be resolved in this little middle grade book. Drita’s family has emigrated from Kosovo to NYC. They are struggling to adapt to American customs, and they worry about their friends and family back in Kosovo who face oppression. Maxie is a headstrong girl who caught up in being the center of attention and struggling to accept her mother’s death. The two make an unlikely pair, but their struggles to feel comfortable with their new realities bring them closer together. Lombard does an admirable job of showcasing the obstacles faced by immigrant families. Drita’s father is a highly educated man who ends up driving a taxi in NYC, and her mother sinks deep into depression because of her inability to adjust to her new home. Although Drita was obsessed with American pop culture when she lived in Kosovo, she is having a tough time living immersed in it all now that she is in NYC. I appreciated that Lombard showed that families moving to the United States often face tough times. I found Drita’s mother’s mental illness to be the most poignant element of the story. The reality is that not everyone can easily cope with such drastic change in their lives. The scenes of Drita’s mother’s descent into illness were unsettling and realistic, and effectively told as if they were viewed through the confused perspective of a girl who is wondering if her mom is ok. Yet the resolution was almost too neat. I understand that the book is only 135 pages long, so of course things will have to resolve quickly – but Drita’s mother made a full recovery from her illness in only a few days, which is not typical for those coping with mental illness. Although the resolution may be easy, it’s still joyful to read. Maxie makes some great personal strides as her friendship with Drita grows. She learns to be less self-centered and more flexible. She’s willing to set aside some of her own longing for attention to better understand her friend. It’s a lovely story about two girls who find commonalities where others saw none. If you’re looking for a story to enhance lessons about tolerance and global awareness, this is a good one. This entry was posted in Middle Grade, Reviews and tagged Friendship, Immigration, Kosovo, mental illness. Bookmark the permalink.